The John Jay Community Trail project was initially originally conceived in 2013 by John Jay Cross Country Coach Tom Nohilly and David Gordon JJHS ‘15. David undertook the initial survey then terrain and trail mapping and took every opportunity to get others involved in the project. The trail clearing started in Spring 2013 initially only by students and coaches. As the concept of the trail expanded, the need to be able to safely cross the north branch of the Cross River was apparent. Originally the bridges were constructed of logs made from trees cut down on site. But the rustic bridges were not inviting to runners and hikers and the project moved into the next phase. David and Tom along with Mark Patek and the Conservation Advisory Council (CAC) for the Town of Lewisboro presented the proposal for the John Jay Community Trail to the Katonah-Lewisboro Board of Education in 2014. The longtime CAC members made planners aware of the trail easement the town had on the Michelle Estates Association land bordering the school. The addition of this section would allow a trail to be long enough for a home cross country meet for the John Jay Cross Country teams. The Katonah-Lewisboro Board of Education took lead agency role in late 2015 and the Town of Lewisboro offered its assistance. 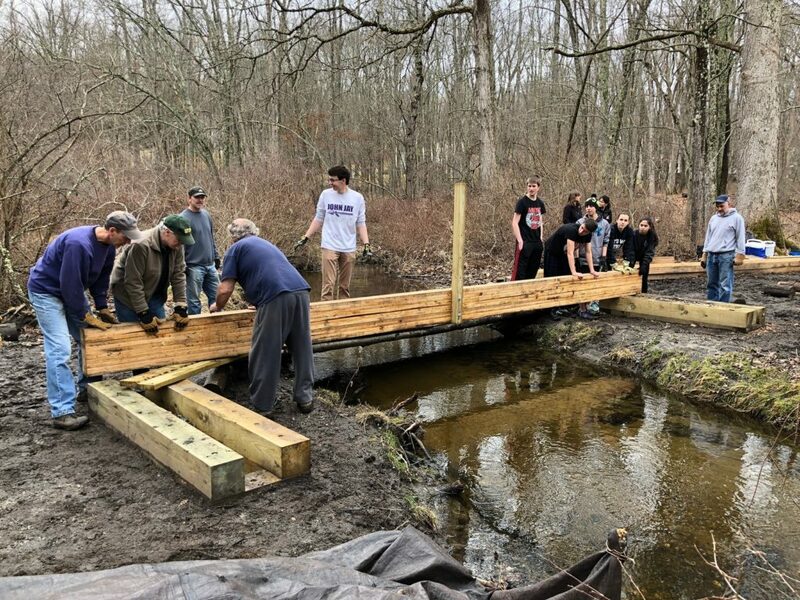 The trail clearing commenced again in Spring of 2016 with members of the John Jay Cross Country and John Jay Track & Field teams, the Lewisboro Trails Committee, and community volunteers pitching in. 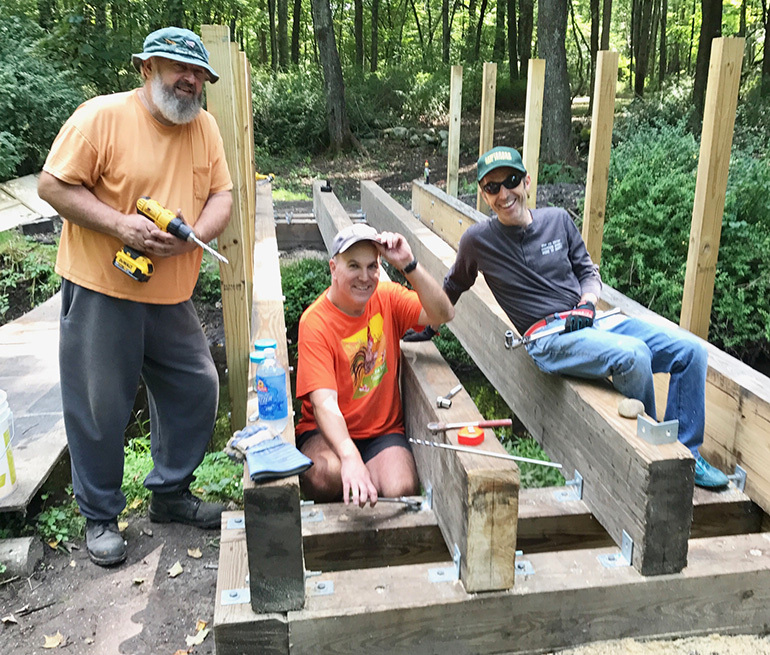 Experienced trail project coordinator and Lewisboro resident Mike Surdej — who is an active member of the trails committee and the Westchester Land Trust — came onboard as chief volunteer in 2016 when the bridge building part of the project received the requirements from the school and athletic association. Bridges had to be six feet wide for to meet New York State Public High School Athletic Association (NYSPHSAA) requirements. The bridges also had to be strong enough for the John Jay Athletic Department Gator utility vehicle to cross over in case of injury during a race. 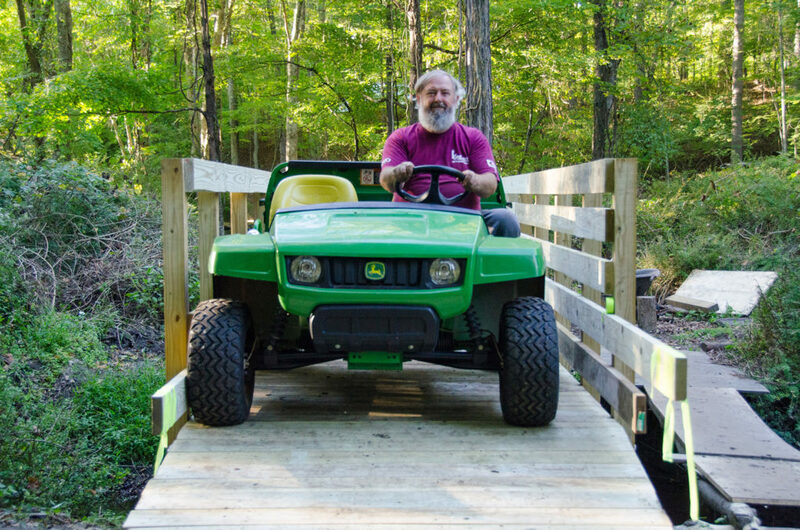 Volunteer and Bridge designer Mike Surdej drives the gator over the bridge the first time. The first bridge to be completed was Bridge #1 which has a span over the river of 26 feet and a total length including ramps of 56 feet. This bridge was begun in the Summer of 2017 and completed in the October 2017. Bridge #2 was started soon after that – and was a much more ambitious project. The span across the river was 26 feet, and the west ramp was 24 feet, but the east side crossed over persistent wetlands and the decision was made to extend the bridge with level boardwalks on top of piers. The length of the pier boardwalk was 48 feet in addition to the 24 foot west ramp and the 26 foot bridge span for a total length of 98 feet. Bridge #2 was finished in April 2018 in time for the inaugural John Jay 5k Trail Race. In addition to labor, bridge building requires a lot of material and lumber. Each bridge has four main beams are 25-26 feet long and weigh in at 750 pounds each. These beams had to be specially ordered from a large lumberyard in Brooklyn. They are essential to the strength and durability of the bridges. Key early donations of $10,000 from Cross Country parents through the John Jay Boosters helped underwrite the initial large material purchases for the bridges in 2017. More recently with the race committee being formed, the organizers have sought donations from a wider group and received $8,300 in additional donations in 2018 from over 50 families and individuals. Community and student volunteers work to place the first of four 26 foot long 8″x14″ beams across the bridge foundation. Donations are open once again (http://runsignup.com/jjtrail/donate) for 2019 to Fund The Finish which includes Bridge #3 (45 feet total length, 26 foot span) and eleven new boardwalks in wet spots on the trail totaling over 200 linear feet. Planners estimate we need approximately $15,000 to get to the finish line. Community and student volunteers have done all of the labor on the project so the only cost has been materials. Some workdays are focused on specific tasks and need only a handful of volunteers. Other workdays are “all hands on deck” and the call goes out far and wide to the team and town volunteers. One example of the latter was moving the 750-pound beams by hand down to the work site. 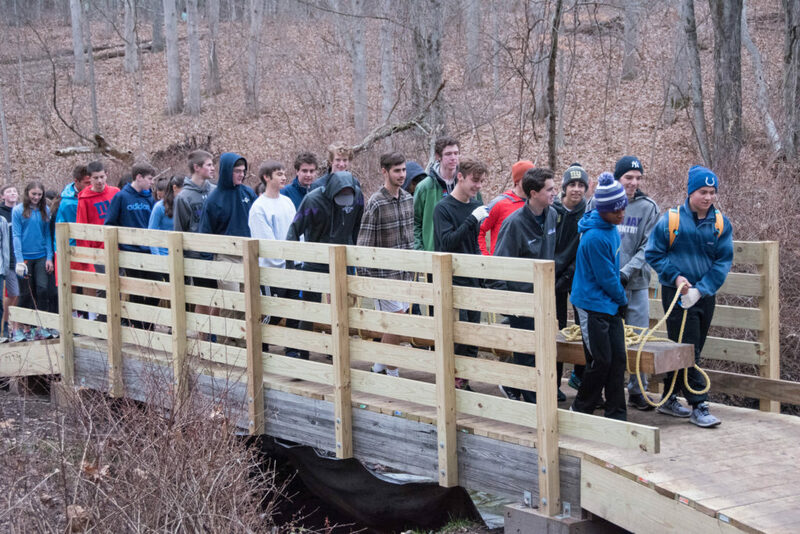 In December 2017, members of the Track & Field team did a rope carry of the beam from “the pit” field through the trail to the bridge site a quarter mile away. Twenty-five volunteers took hold of a rope snaked underneath the beam and walked the beams into the staging area near the bridge location. It was a true example of many hands making light work. In addition to the trail system entrances from the schools, there are also access points from Orchard Square Shopping Center, Michelle Estates, and The Meadows. The trail is open to the community and is becoming a well-used amenity for residents and visitors. Video showing early clearing, building Bridge #1, and start of bridge #2 construction.